Mild winters and wet soil can create conditions that are ripe for a horrendous swarm of Japanese beetles (Popillia japonica). Wisconsin faced throngs of these invasive garden pests in 2016 after a relatively warm winter, and they were widespread in 2017 as well. Despite the preceding winter, reports of Japanese beetles chewing through the landscape are up, and their numbers are likely to be higher in Wisconsin than in previous years. Gardeners have a variety of management options for minimizing Japanese beetle populations, but should be mindful in their usage of insecticides. These pests are in their most active season from July to mid-August, and so close care is especially important when bees and other beneficial insects are in their peak time for foraging pollens and nectars. However, there are methods for managing Japanese beetles, both adults and grubs in landscapes and turf that can lessen the negative impacts on pollinators. Here are five options for battling this growing pest. Bacillus thuringiensis, or Bt, is a bacterial pesticide that is toxic some insects. A newer variety called Bacillus thuringiensis galleriae is moderately effective on adult Japanese beetles and can be applied on the foliage of small sized landscape plants and vegetable crops. This specific variety of the insecticide doesn't affect pollinators, and products with Bt galleriae as an ingredient can be purchased from garden supply retailers. However, some members of this type of pesticide, like Bt aizawi, are not pollinator friendly. Acelepryn is the brand name for another relatively new insecticide that is known to provide good control of Japanese beetles when applied to the leaves of landscape plants. It is non-hazardous to bees, but should only be used on ornamental plants. Acelepryn can be obtained through wholesale landscape vendors. On fruits and vegetables, standard organic products like neem oil and spinosad can be sprayed during late evening hours after bee and pollinator activity has subsided. It is important to read the labels on these products for instructions and safety. Small-sized landscape plants such as roses, vegetable crops, strawberries and raspberries can be protected using nylon insect screens or a floating row cover from afternoon until late evening hours. The fabric should be draped over the plant and pinned to the ground. However, the screens should not be used when daytime temperatures exceed 85° F or on blooming vegetable crops like pumpkins and squash, as they require bees for pollination. Before scheduling preventive grub turf applications, flowering lawn weeds like clovers should be mown down to prevent bee toxicity. Acelepryn can also be used for preventive application since it is known to be non-hazardous to bees. Immediately after application, a light irrigation (1/8 inch) should be scheduled to leach the insecticide into the thatch layer. 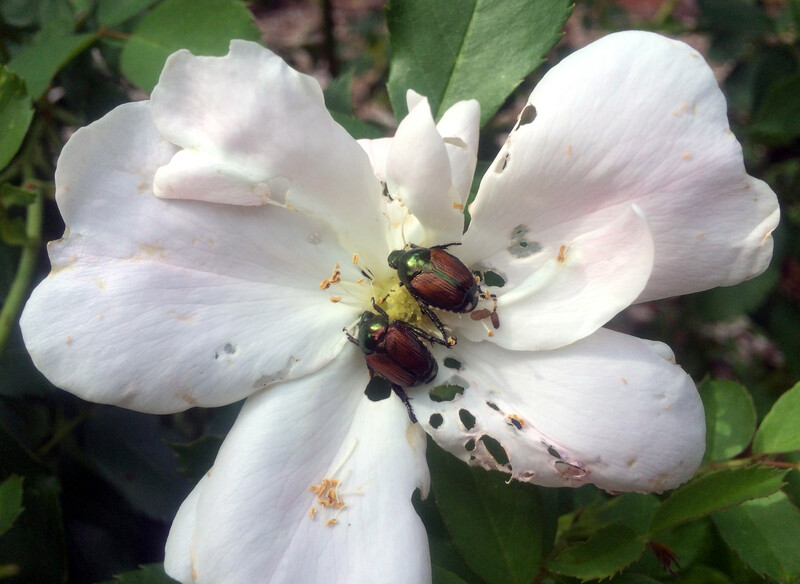 Although Japanese beetles can damage the foliage of mature trees and shrubs, these woody plants have a higher tolerance and will typically leaf out the year after an infestation without the application of foliar spray. As these insects are most active in the heart of summer, so halting the watering of lawns during this time can help prevent them from laying eggs in the turf. Gardeners who face small populations of the Japanese beetles can pick individuals off landscape plants by hand and drown them in soapy water. Beetle traps shouldn't be used to control the population as they attract thousands of beetles and can result in more damage to the surrounding landscape. Editor's Note: Vijai Pandian is a horticultural agent and educator for the University of Wisconsin-Extension Brown County. This article is adapted from an item originally published by the Green Bay Press Gazette. 5 Ways To Battle Japanese Beetles While Protecting Pollinators was originally published on WisContext which produced the article in a partnership between Wisconsin Public Radio, Wisconsin Public Television and Cooperative Extension.